Students acquire the world's top level expertise and skills in the fields of animals, pet animals, aquariums, and marine species. The college offers the world's top-level expertise and skills in the fields of animals and aquatic organisms by introducing high-quality education programs based on the first-of-its-kind educational partnerships with Aqua Design Amano Co., Ltd., the manufacturer of the world's largest aquarium in Lisbon, Portugal, and Pet Partners, an American company. We provide guidance tailored to each student's needs and aptitude including how to select an internship partner company. We help students turn their internship experiences into employment. Students learn animal breeding and management based on animal welfare and contribute to the development of happy relationships between animals and people. Students aim to acquire animal healthcare expertise and skills, which are required for working at animal hospitals, and become veterinary technicians who can be trusted by veterinarians and animal owners. Students aim to obtain pet animal nutritionist certification and become veterinary technicians who can give overall guidance on pet animals including nutrition. Students aim to become groomers who can take care of not only dogs' external beauty, but also internal conditions through stress-free grooming. This is a course to develop dog trainers who can give pet owners guidance on the discipline and management of pets through training based on ethology. This is a course to develop professional aquascape designers through the direct guidance by Aqua Design Amano (ADA) staff. 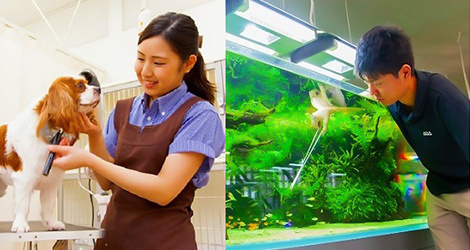 Students learn how to breed and train marine animals and serve visitors to aquariums and aim to become professionals who can convey the attractiveness of living creatures and the environment.